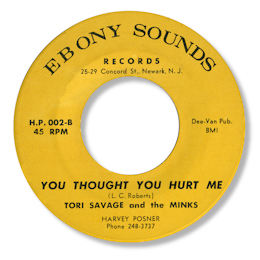 Like the excellent Mr Shtogun release, this New Jersey obscurity comes from the Ebony Sounds days of Harvey Posner before the label became a byword for sweet soul. Both sides are downbeat, and full of gospel influences, from the organ/piano in the rhythm section to the righteous female chorus. But most of all from Tori’s big voice, lovely sense of timing and occasionally coarse grained delivery. “Tell Me” isn’t quite so melodic as You Thought You Hurt Me which is a really fine blend of the church and the blues. And that always makes the best music.